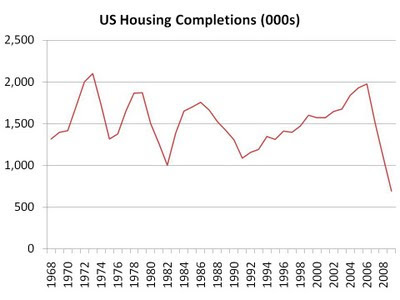 The boom and bust phenomenon in housing construction is common throughout history! But it just hasn't happened for a while, which may have fooled people into thinking this is not a highly cyclical industry. Notice that for whatever reason (e.g. cheap credit, low supply due to the fact that there was no preceding boom), there was no bust in the last recession in 2002. But current reductions in construction have caused panic levels to soar, allowing investors the option to purchase assets at great discounts. While the current low levels of construction are taking a big bite out of GDP, this is necessary in order for existing inventories to be absorbed. Once supplies have been sufficiently reduced, this industry will be back. When that is, is anybody's guess, but when the market is fearful, one can find companies in unfavoured industries that trade at discounts to their assets, which is what value investors try to do.